Celebrate an inaugural occasion with an uplifting promise of hope, cheerfulness, and nourishment of the heart. Send your warmest wishes with this gift package priced within budget at only $90. 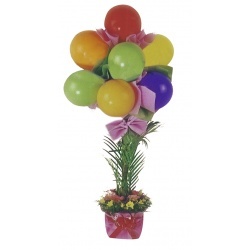 It consists of assorted flowers of only the freshest, choicest quality, like anthuriums, mums, and gerbera, arranged elegantly in a bamboo that stands approximately 8 feet tall. This gift package is ideal for Inaugural occasions. 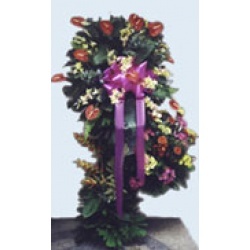 Send your warmest inaugural wishes with anthuriums to symbolize the heart, orchids for beauty, mums for hope, and birds of paradise for freedom and a good perspective. 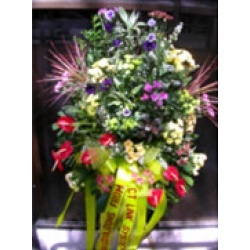 Priced within budget at only $128, this gift package consists of only the freshest, select-quality assorted flowers like anthuriums, orchids, mums, and birds of paradise that stand elegantly in a driftwood. Celebrate an inaugural occasion with an uplifting promise of hope, cheerfulness, and nourishment of the heart. Send your warmest wishes with this gift package priced within budget at only $115. It consists of assorted flowers of only the freshest, choicest quality, like vanda orchid, roses, carnations and alstomeria arranged elegantly in a bamboo that stands approximately 8 feet tall. 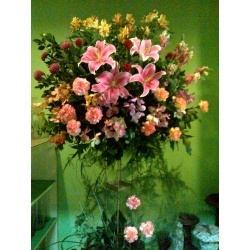 Send your best wishes with an inaugural standing approximately 8 ft tall which consist of mums, alstomeria and gerbera.